A great herb for the kitchen and for health. 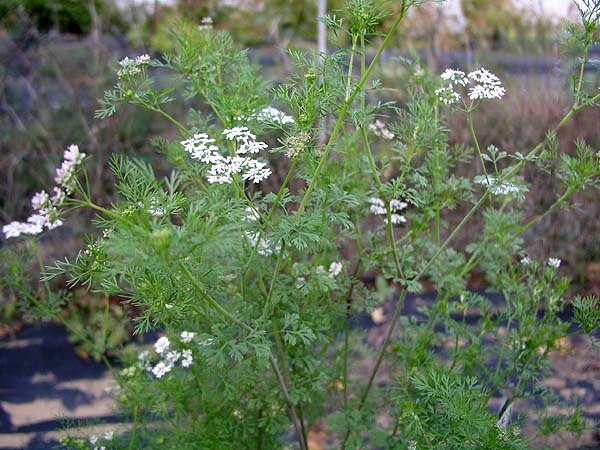 Cilantro is a charming and very versatile herb which many people often find difficult to grow. I am probably asked more questions about growing this than any other herb. It’s not really hard to grow, you just need to know it’s secrets then it’s pretty easy. Here is how. Cilantro is a interesting two in one herb. The leaves are used in cooking and called Cilantro, while the seeds – actually they are ‘nutlets’ not seeds but we will get to that – are also used in cooking and are known as coriander. So you can grow this and get two herbs for the space and price of one. Most people tend to want and use the leaves of this plant so we will refer to it as Cilantro here. This plant likes cooler weather and does not like hot sun, so if you planted your seeds or transplants in full sun for a summer harvest you are going to be very disappointed. The poor little things will just wilt and die. The need to be planted in spring and fall for a good harvest. You can get away with planting in the early summer if you choose a location in your garden that stays cooler. Perhaps it gets a nice breeze from across the lawn or is sheltered by some trees. The location will also need some shade from the hot noonday sun to get any plants growing past late June. As we said before Cilantro seeds are not really ‘seeds’ they are called ‘nutlets’ this is because each ‘nutlet’ contains several seeds in together. Don’t try and crack them apart to plant separately they really don’t like that. This means that you will get several little plants growing in the same space. This is just fine, in fact its best if you plant several nutlets in the same area so you get a nice little bunch of leaves growing in a clump. This makes them much easier to harvest when you want them. 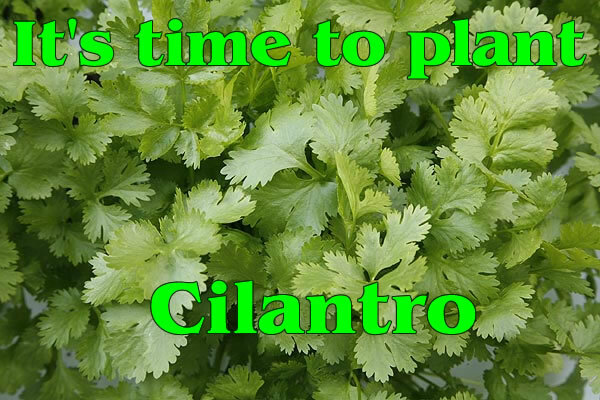 Cilantro is one of the plants that you do want to direct seed it does not do well in transplants and you get much stronger plants if they are direct seeded. 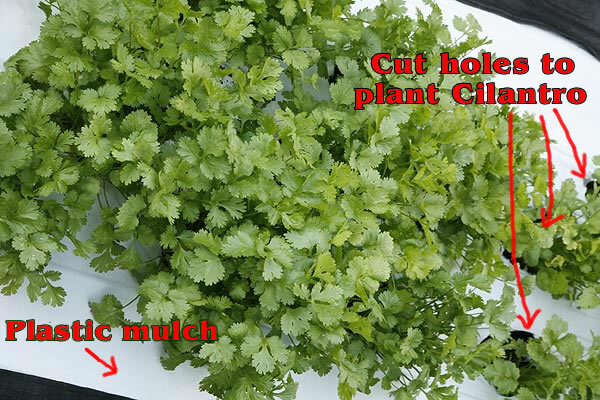 Cilantro grows quite quickly so don’t plant more than you can deal with in one go. It might be best to plant a few every week or so. That way you get a continuous supply of leaves to use for a longer period of time. Don’t expect to get any in the summer months in hot areas though. Prepare the chosen area for the cilantro. I like to use a ground cover mulch with holes cut in it. 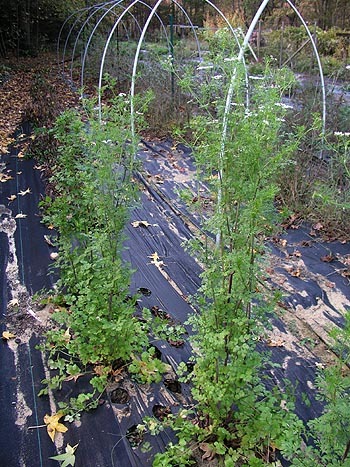 This keeps the weeds down to the small area where the cilantro is growing and reduces the amount of work needed. However you can use all kinds of things to keep the weeds down, several layers of newspaper with holes cut in the right spots will work. A heavy layer of mulch around the desired planting ‘holes’ is also an option although take care that this is not creating warmer ‘wells’ in the mulch as the plants won’t like the heat. Or you can just leave it and pull out the weeds, it’s your choice. Do not use clear plastic, it heats the ground up too much. Plant at least 4-6 nutlets in each patch of ground. Spacing at around one foot apart. Keep the plants watered. This is an ideal use for a soaker hose run between the plants so you can water them every day keeping the ground moist. Once the leaves have reached the desired size cut the plants down to the ground with scissors or floral snips. This is usually around 8-10” tall (20-25 cm). If left any longer the plants will start to bolt tall stems for flowering and the leaves are not as easy to harvest. Once cut the plants rarely regenerate leaves, they are basically spent and need to be replaced if there is still enough cool weather ahead, if not pull them out and plant something else. If desired leave a few plants to go to seed so you can collect more nutlets for your next sowing or use the coriander in cooking also. Plants can grow pretty tall up to 5-6 feet (152-183 cm) in height so make sure you have space for them. They are really quite pretty delicate plants and make an interesting addition to the garden. Once its gone to seed wait for the seeds to turn just brown, and then cut off the seed heads before the nutlets start to fall. (it wont reseed for next year, they don’t like cold winters.) Spread the seed heads out to dry away from the bleaching sunshine then rub them to remove the nutlets from the stems. This can be quite a fiddly time consuming task which is why most people buy their coriander rather than collect their own. Getting all the stalks out is a real pain. Once you have your seeds keep them in a cool dry dark location for cooking. If keeping for seed its best to store them in the refrigerator for maximum viability. Cilantro is a strongly scented and flavored herb and is not usually bothered by wildlife but rabbits will sometimes take a bite. This usually means snipping the plant off at the base, then deciding they don’t like it and dropping it. This is extremely annoying. If this happens you may need to put a small fence around your plants. Well if you are Italian or Indian then cilantro is a major part of cooking. Growing your own is an ideal way of getting your own organic herb since most supermarkets don’t offer organic herbs. Some do but they, of course, not inexpensive. Cilantro is a great health herb. Cilantro is the go to herb for helping to pull heavy metals from the body. It’s the main reason that I grow so much of it. I use it myself and encourage my everyone else to use it too. This is especially important if you eat things like tuna, which is known to contain heavy metals especially mercury. Consuming a lot of fresh cilantro on a weekly basis can help pull any heavy metals and possibly other toxins from the body. It’s a go to herb that everyone should use in today’s world. More information on growing cilantro.